The Greatland Section of Society of Women Engineers was organized in the late 1980s. Section organization was started independently by Bonita Geary, Professor Joyce Martins of University of Alaska Anchorage and Diana Evans, who had recently moved to Anchorage and had been a member of the SWE Golden Gate Section. Once they learned of the other's efforts, they began organizing together, by contacting their engineering associates. The first organizational meeting was attended by about 20 people, and was held at the University of Alaska Anchorage. The interest encouraged the group to seek section status, which required at least ten members and commitment of officers. The charter was hand-carried to the national membership chair in Philadelphia. 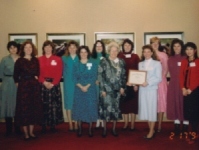 Our Charter Banquet was held at the Regal Alaskan in February 1990, and the charter was awarded by the SWE National President Maggie Hickel (of 3M). Maggie was presented with an Eskimo yo-yo which she promptly learned how to yo! The Banquet was also attended by retired Alaskan Civil/Mining Engineer Irene Ryan (SWE Fellow). Irene began her career during WWII building runways, paving the way for women engineers who follow in her footsteps. (Irene died in 1998). Greatland Section held the Fall Region J conference in 1992, which was superbly organized by Bonita Geary, and about 20 representatives attended from our sister sections in Portland, Boise, Seattle, and Eastern Washington. We didn't host a Region Conference again until 2006, when over 100 attendees from our sister sections - both professional and collegiate - in five states visited us! SWE began participating in Engineers' Week in 1991. We have presided over the scholarship evaluation program since then. Debbie Mannix represented SWE as the Co-Chair of the Engineers' Week organizing committee in the early 1990s. In that same year, we arranged a NASA astronaut for the E-Week Banquet Speaker. Laura Strand co-chaired E-Week in 2000 on SWE's behalf and Melissa Branch (then Mormilo) had the honor of doing the same in 2006. SWE Greatland's Engineer of the Year nominees are community leaders we can be proud of!